As a beginner painter, the only choice for basecoating was a Flat Wash. I usually used a 3/4″ or 1″, depending on the size of the project. This was always a time consuming step that I dreaded. First, a layer of sealer, sand, next the first layer of basecoating, another quick sand, then another layer, or maybe two more, to achieve a nice solid base. If working on a 12″ plaque, painting 1″ at a time would take forever! Plus, there are always all those square “stop and start” marks created by the brush! As I progressed as a painter, I stumbled across the Oval Wash. Wow, this is an amazing brush! For one thing, no more “stop and start” marks. The gentle curve of the bristles softly blends the strokes together effortlessly. I was in love with this brush! I still love my filbert wash for many reasons, but I have since found the most wonderful tool for applying sealer, basecoat and even the final varnish coat. The Specialty Sponges are now my newest, best friend. They are incredibly versatile and functional. The set consists of two sizes, each size has a small and a large end, which offer a total of four different sizes. The foam construction is very dense and durable. I have used my sponge for over two years and it is still going strong. Because of the density of the sponge, it does not leave any ridges (unlike the brush), it does not create any bubbles (unlike most sponges), the hourglass shape helps keep fingers clean. With my specialty sponges, I can seal and basecoat with two or more layers of paint in less time that it takes to apply a single layer of sealer using a wash brush. I call these sponges my miracle sponges. With the time saved, I can now spend more time doing what I love…painting! Plus, the best part, they make my projects look really, really good! No more brush strokes, no more varnish bubbles, no more messy fingers… Because the sponges apply paint, varnish, sealer, etc… so evenly, drying time is fast and coverage is perfect. Another feature is shading. Load a small amount of paint on the edge of the sponge. Using a small, circular motion, rub the sponge around the edge and see what a wonderful, soft blended shading it will create. This is another super time saver as the results are quickly and beautifully produced. I was simply astounded at all the different ways these sponges can be used. They are perfect when stamping with paint. The large sponge will coat the stamps quickly and evenly, making stamping a cinch. To clean the sponges, I hold them under the faucet, squeezing until the water runs clear. If you want your sponges to have a long life, make sure to keep them clean. Once paint dries on them, it is not good news! To sum it up, the Specialty Sponges have revolutionized my painting. I can be twice as productive and the end results are much more professional. I have decided that I love my microwave, but if given a choice between the microwave and my specialty sponges, I would miss microwave!! This entry was posted in Brushes, Painting, Products on September 7, 2014 by Chris. It always seems when the seasons change, I feel the need to freshen up my decor. I love the challenge of redecorating on a dime. I decided it was time to retire my hunter green theme in my living room. I bought some new decorative toss pillows with touches of celadon and cinnamon. All I need is an inspiration piece and my theme is on a roll! My daughter was dropping some things off at Goodwill. We decided to stroll through and see what we could find. I was so excited when I saw a tired old ginger jar lamp. Believe it or not, the lamp with shade was only $2.99! I knew with my stash of Chalky Paints I could update and make it look fabulous. 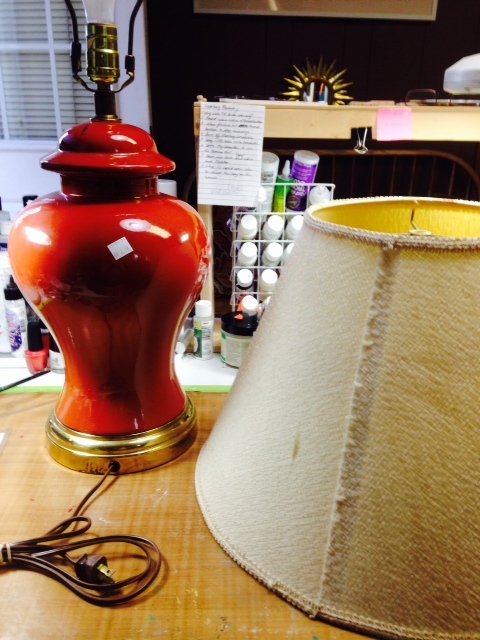 I couldn’t wait to get home to start working on my “new” lamp. I painted the tired, spotty brass with Lace (a very pretty creamy color). To tone it down, I waxed it with Golden Brown Creme Wax. Simply wipe on and buff off to create a soft sheen. The lampshade was very dingy. I was thinking I would just purchase a new one, but, with nothing to loose, wondered if I could paint it?? The lampshade had a fabric texture. I thinned down the Lace Chalky Paint and used a large, thick brush to work the paint into the texture. It took time to cover the entire shade, but it was worth it. It looked brand new! All in all, it was looking pretty good, however, I wanted a designer lamp. I selected a stencil that would be perfect for my new decor. I used the Chalky Paint to stencil the lettering Rustic (brown) and added some Cameo (cinnamon) highlights. As you can see from the end results, the lamp is spectacular. My confidence level is soaring and I can’t wait to start my next project! This entry was posted in Brushes, Painting, Products, Stuff that makes me smile..., Techniques on September 2, 2014 by Chris.